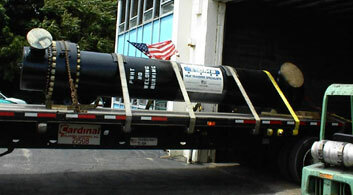 CMS Heat Transfer Division, Inc. (CMS) puts their years of heat transfer know-how to work for you. In addition to sizing a shell and tube heat exchanger for customers' specific heat transfer needs, CMS engineers incorporate measures to provide ease of maintenance and longer equipment life. This equates to both smaller initial capital and lower maintenance costs over the years. 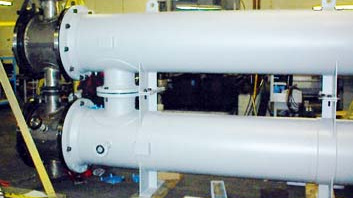 Custom Design: CMS can fabricate, refurbish and repair nearly every model of shell and tube heat exchangers. We also offer new designs to accommodate your special mechanical, process, economic and maintenance concerns. For an extensive variety of U-Tube, straight and multiple pass, fixed and floating head models, CMS is your source for shell and tube design. Every heat exchanger CMS constructs is available in a wide variety of materials, including carbon and stainless steel, titanium, naval and admiralty brass, CuNi and many other nickel alloys. New and Replacement Bundles: CMS manufactures a variety of new and replacement bundles in all sizes and materials of construction, from 4" x 24" to 54" x 30' long, including direct OEM replacements and increased surface area.